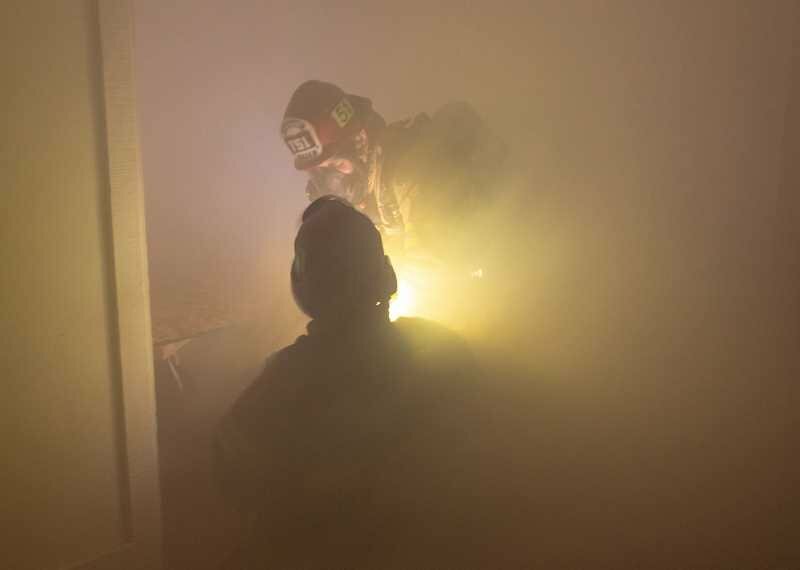 With smoke enveloping the hallways and blinding firefighters, a group of Tualatin Valley Fire & Rescue personnel trotted down a staircase to the bottom floor of a dilapidated building next to Charbonneau Country Club to rescue an ostensibly downed firefighter. "Cover your eyes and then try to get yourself through a building like this ... that's what they see," TVF&R Public Affairs Officer Stefan Myers said. Though the scenario was realistic, the life of the immobilized firefighter was not in danger that day. Instead, the fire crew was simulating the rescue to give firefighters in the Rapid Intervention Team (RIT) better training in case a real emergency arose. "We're (RIT) the only crew on the fireground whose primary job is not to put the fire out,"
the rescue or prevent them from being trapped or lost in the first place." 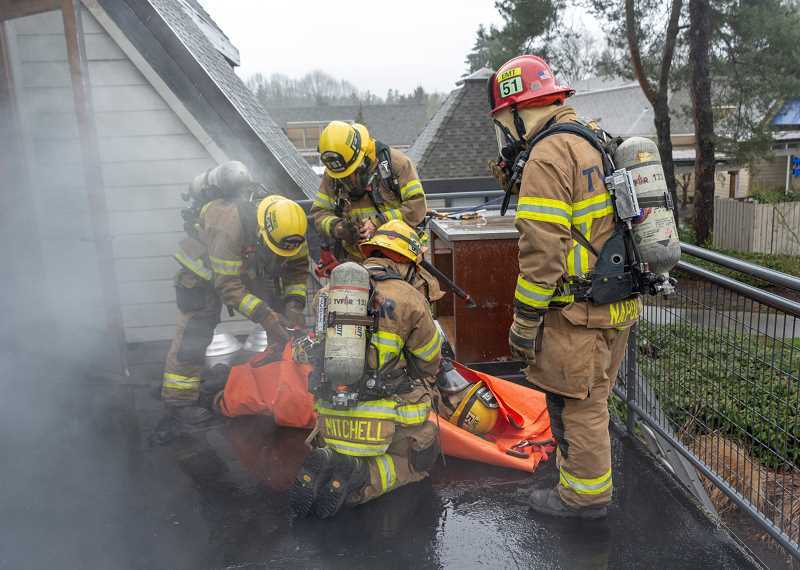 The fire department, which serves all of Wilsonville, conducted its first two training sessions at the building located at 32050 S.W. Charbonneau Drive Feb. 11 and Feb. 18 and will conduct its final training session 8 a.m. to 5 p.m. Monday, Feb. 25. "From a 911 emergency response perspective, we just have better trained firefighters," Myers said was a goal of the trainings. "We also just have the opportunity to interact with the communities we serve." that used to be home to a restaurant. "We're hoping it could be a future clubhouse facility for us," CCC Manager Jim Meierotto said. "We're currently in the process of doing outreach in the community to see what they want to do with it." The scenario last Monday involved firefighters winding through the multi-story building, spotting the downed firefighter who was trapped under an assortment of objects and then carrying them out of the building through a door, a rooftop window or another exit. Because a fire-stricken building is typically scattered with broken objects, the department also placed barriers and wires in the path of the firefighters and blocked off certain hallways so that they had to find a different route. The crew didn't actually start a fire for the exercise, but did inundate the building with smoke. "The walls, debris, everything is not going to be where it was before the fire started," Myers said. "The keys on this one would be the search techniques to find the firefighter and get to their location, then packaging them up ... and then finding the best course out of the building that gets them toward where they can provide emergency medical assistance to the individual or get them in the ambulance so they can be moved to the hospital." The firefighters can simulate some of these exercises at their training facility but Johnson said doing so in an unfamiliar building is much better practice for a real life-threatening event. "At the training center everyone knows the layout and has seen it a million times but when we get into these buildings it's completely unfamiliar and (we get) to simulate what happens in the real world," Johnson said. "Sometimes it's commercial and sometimes it's residential but it's all about where we hear word that a structure is available and that (they're) going to be getting rid of anyway and then we coordinate with them," Myers said. Though a major fire may never occur at that specific building, Meierotto said giving the fire department the opportunity to practice real-life scenarios could benefit the Charbonneau community and other areas within its jurisdiction. "Having a facility like that that's useful to TVF&R is a value to the community," Meierotto said. "It makes them better at their job so they are better at serving us in case of an emergency."